A resort offering something for everyone and a great all-round option for families, couples and groups of friends. 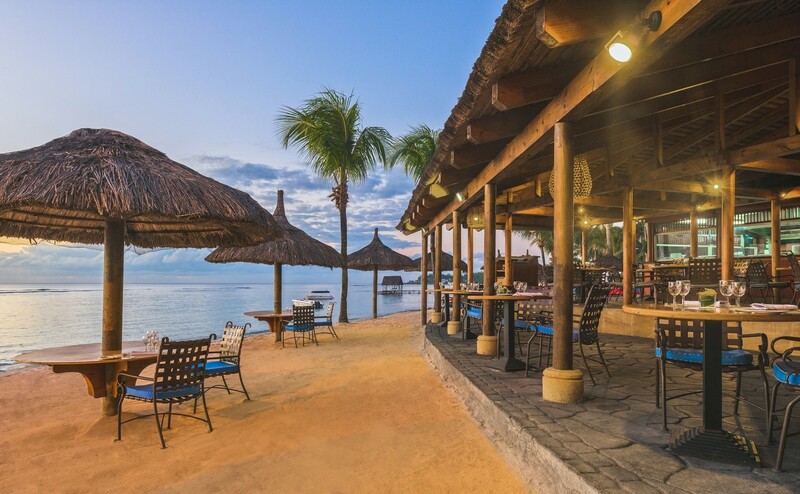 Naturally, the beach is beautiful and there is a wide range of dining options. 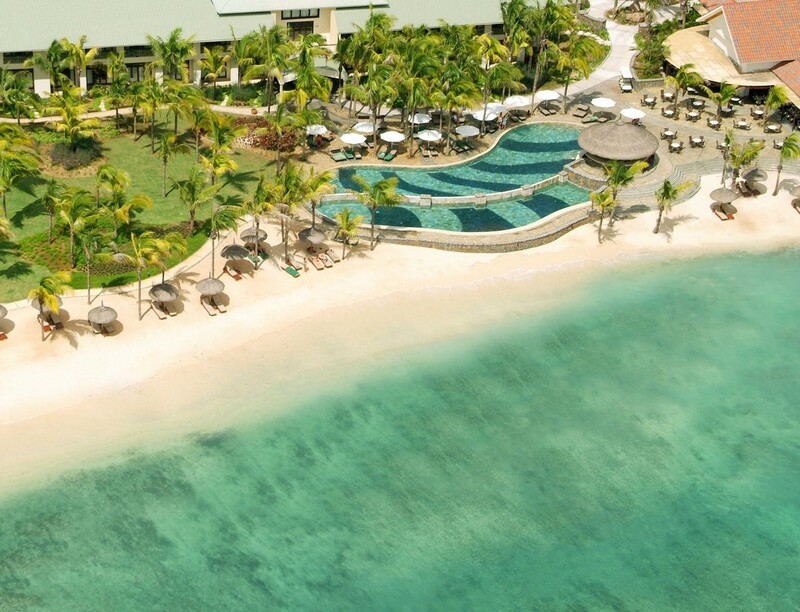 Busy and bustling, the Le Meridien is for those who love to be around people and, with Grand Baie so close, there really is something for everyone. 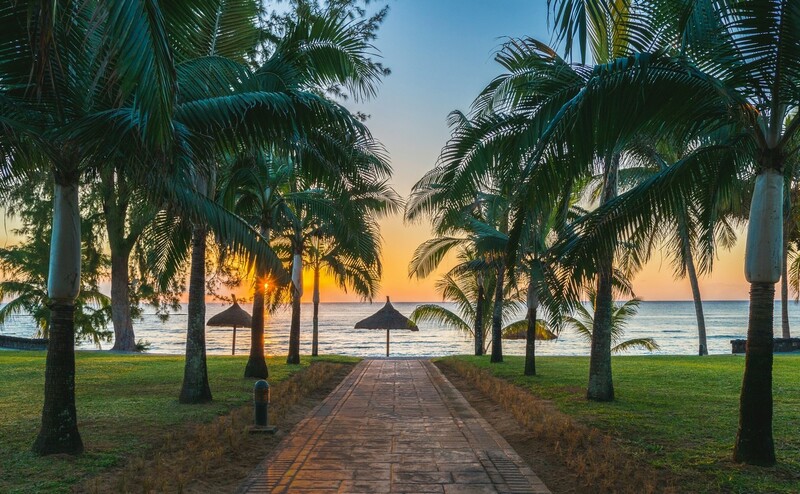 Le Méridien Ile Maurice stands at the edge of 1,000 meters of sparkling ivory sands on the North-West coast of Mauritius in the bay of Pointe Aux Piments. Lush gardens create the perfect atmosphere for a romantic idyll or a serene getaway. Spacious and perfectly located on the first floor offering sea views. 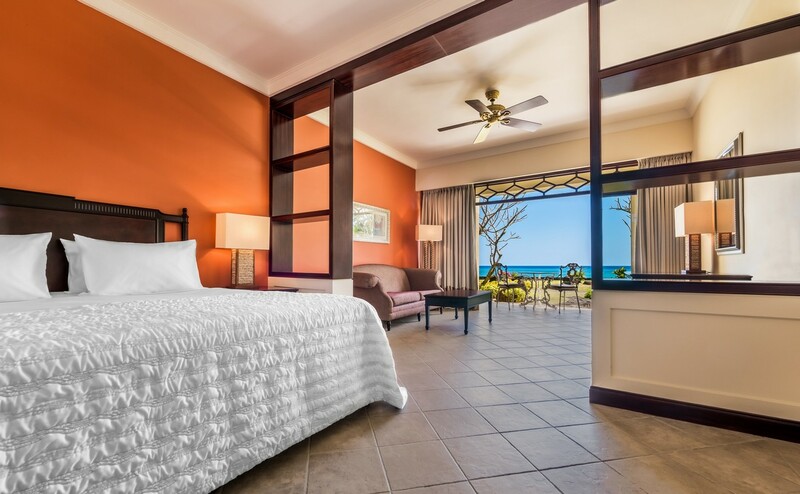 Spacious and perfectly located on the ground level, only a few short steps away from the natural white sandy beach, all Deluxe rooms offer direct access to the tropical garden and beach. Spacious and perfectly located on the second floor offering premium sea views. Featuring attractive views over the lush tropical gardens of Le Meridien Ile Maurice, the Nirvana Garden View Rooms, perfectly located on the ground level and the first floor, offer a unique garden terrace. These rooms are located on the ground and first floor and offer exquisite views over the Indian Ocean. These spacious Family Suites, perfect for a family of four will suit any family’s needs during their stay at Le Meridien Ile Maurice. One large room of 100 square meters that divides into two bedrooms with a sliding door creates a home away from home experience. Located on the top floor, with clear views of the Turquoise waters of the Indian Ocean, these hugely spacious Honeymoon Suites are a wonderful getaway for a couple looking for the perfect way to start their new life together. One large room of 100 square meters that divides into a bedroom and a lounge area with a sliding door creating a serene atmosphere. A 150 m2 duplex suite with soaring 30-foot ceilings and views over the Indian Ocean, the Duplex Family Suite includes a Jacuzzi tub in the bedroom, elegant furnishings, a 42-inch plasma flat screen television, a bar, a dining area and lounge, and a dramatic terrace. The Duplex Family Suite is perfect for families as it offers a separate bedroom and bathroom for children. A 150 m2 duplex suite with soaring 30-foot ceilings and views over the Indian Ocean, the Royal Suite includes a Jacuzzi tub in the bedroom, elegant furnishings, a 42-inch plasma flat screen television, a bar, a dining area and lounge, and a dramatic terrace. While named 180°, the restaurant provides visitors a 360° view of the open kitchen. 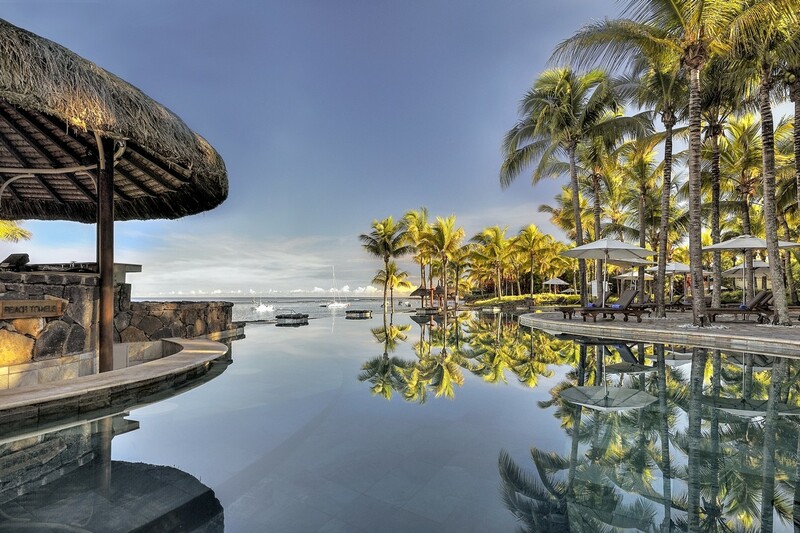 The 180° restaurant and terrace offers a panoramic view of the expansive Indian Ocean. An extensive breakfast buffet is presented each morning including freshly baked croissants, plunged coffee and tropical fruit displays. The evening ambiance is accentuated with diverse flavours from Asia to Europe, with specialist chefs creating the magic of "à la minute” cuisine in a centrally located open kitchen. This chic restaurant combines timeless Mediterranean gastronomy with contemporary Mauritian cuisine, and features the finest wines and cocktails to complement each meal. This outside contemporary Indian restaurant offers fine table d’hôte dining for dinner by the main pool. Offering light salads, small plates or "tapas,” and grilled delicacies and set against sunlit and wave-battered sands, Shells serves elegant and intimate seafood meals. Fancy a snack? La Croque serves casual poolside dining, including pizzas, salads, and sandwiches. Kids 4 to 11 years can enjoy the facilities at the Penguin Kid's Club. Caring, professional staff supervise a range of exciting activities to entertain kids and keep them happily occupied, so parents can relax and enjoy the resort's many amenities free of worries. Open 09h30 - 19h00 (closed on Sunday). Available free of charge throughout the resort.